Subtasks are stepping up their game in the platform, no longer are they To-do’s little brother. Introducing Scoping on a Low Level. You can move Subtasks around to change the order. You can add an estimate to Subtasks of how long you think the subtask will take. 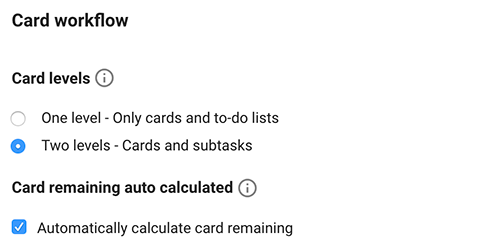 In the Remaining hours section on the card, you can see the Subtasks' total hours, the Done Subtask hours, the Time Entries, and Remaining. When you complete a subtask the hours are subtracted from the remaining hours. 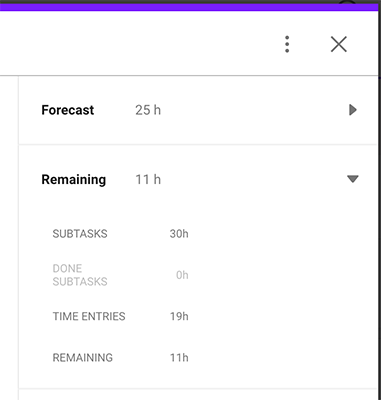 It’s important to note that the Low, High, and Forecasted estimates are not affected by the subtasks, i.e., those remain the same as how you set them in Scoping. You can choose if you would like your Remaining time to be calculated automatically or manually. The new projects you create have the default to automatic calculations, but if you want to manually adjust your time remaining field, then you can simply uncheck the button. Why select manual? Well, if you realize that the estimation for your task is not long enough, then now you can simply change the remaining time and add more to it. What this does is keeping the AI intact and Forecasted algorithm constant. Simply put, the Forecasted hours are not affected by the change of remaining time. Step 1: The setting can be found in your Project Settings in the side menu.